Are you looking for new ways to optimize the use of your lot? Or do you want a home with a great view out the rear of the house? If so, then take a look at our Angled floor plans. With angled garage floor plans from Donald A. Gardner Architects, you can enjoy a spacious, attractive home with all of the modern design features you desire, even on a small or oddly shaped lot. 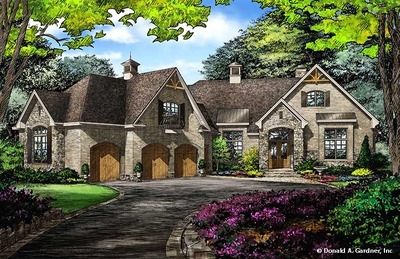 If you feel that angled garage house plans would best meet your needs, Donald A. Gardner Architects has a number of options for you to consider: We have angled home plans ranging from a cozy feel, such as The Rowan measuring 1,822 square feet, all the way up to The Heatherstone, which measures 6,155 square feet. Choose from homes with angled garages that have a walkout basement foundation, or select from our one or two-story home plans with slab or crawlspace foundations. We even have multi-story options for those who need space in all directions. Use our online search tool to narrow your house plan options. Easily search by size, features, number of bedrooms and more to find your ideal plan. The Bluestone (a favorite among these angled plans) is a modest house plan, measuring 2,195 square feet. However, it packs a lot of functionality in this four-bedroom, three-bath, one-story home design. The coffered ceilings and rear bay windows offer additional space and lots of natural light. The large walk-in utility room and nearby closet allow space for a drop zone of backpacks, coats and all of your other necessary items. At Donald A. Gardner Architects, we want to ensure you can find exactly what you need. 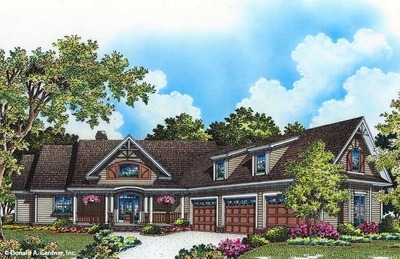 Start shopping our angled house plans today to find your dream design. If you cannot find your perfect floor plan from the angled house plans here, take a look at our modification services, and let us make changes to a home design so it becomes your perfect dream home!